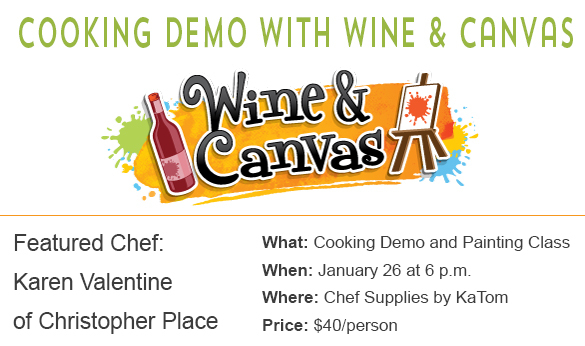 On January 26, Chef Karen Valentine will demonstrate how to make two sweet treats for your sweetheart! 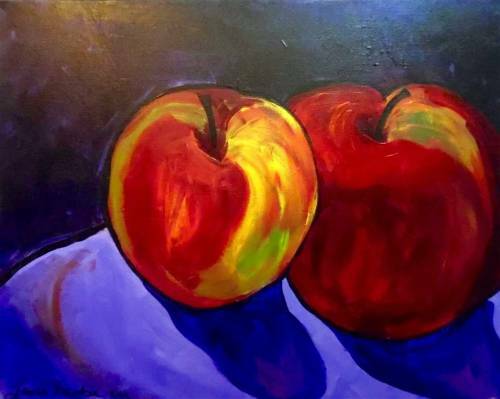 Plus, an artist from Wine & Canvas of Knoxville will be in the house to give us step-by-step instructions on the featured piece of art. Everyone will go home with a painting and satisfied tummy! Seating is limited, so be sure to book your spot soon. Hope to see you here soon! Chef Karen Valentine is Head Chef at Christopher Place Resort, a Four Diamond Inn and Restaurant, a position she has held for seventeen years. She is a graduated from Walters State School of Culinary Arts and a winner of the coveted Iron Skillet Challenge. Appearing on WBIR’s Live at Five, she has prepared such signature dishes as her Poached Pears with Fruit Confetti. Chef Valentine’s culinary talents have been showcased on Nashville’s WTVF and Asheville, NC’s WLOF, as well. And her skills in the kitchen have been featured in issues of Blue Ridge Country and East Tennessee Marquee. During the filming of the reality TV show, Outsiders Inn, Valentine served as personal chef to the cast. She also regularly participates in the annual March of Dimes Signature Chef Auction. Come join us at Chef Supplies by KaTom for our bi-weekly cooking classes. During each class, chefs from the region present new techniques, delicious recipes, and quite a bit of entertainment. Whether you have a list of questions for our guest chefs or you’re just looking for a casual night out with friends, we hope to see you soon at Chef Supplies by KaTom.